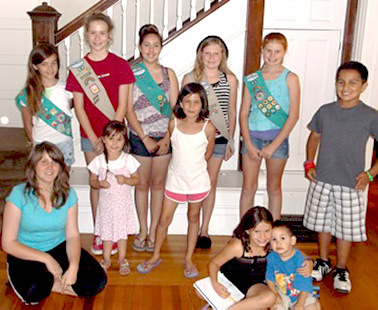 On a Sunday afternoon The Sheepfold families were blessed by Girl Scout Troop 99 from Redlands. A group of five young ladies ranging from ages 10-12 and their two leaders came and spent precious time with our kids and moms. They brought games to play which they left with the kids and donated a box of books as well. They brought juice and cookies to serve. It was heartwarming to see this group graciously playing with and serving our Sheepfold families. These girls are working on a badge in an "Amaze" category and let me just say that they also gave us an "amazing" cash donation that they worked hard for by collecting cans and bottles so that they could give this gift to our families. It was a beautiful time of fellowship and blessings all from these Girl Scouts who wanted to make a difference in the life of our families. After their time with us, the girls also allowed us to pray with them. Thank you so much Troop 99! You are AMAZING and have blessed us by your generosity!